As you are by now probably aware, President Trump’s proposed federal budget, released on March 16, eliminates all funding for the National Endowment for the Arts and ends 50 years of successful federal investment in our nation’s creative and cultural vitality. We’d like to stress that currently allocated grants are not in jeopardy, but we still have a lot of work to do to protect the future of the arts in our communities. Though its FY2016 budget of $147.9 million makes up just .004 percent of the federal budget, the National Endowment for the Arts’ impact is deeply felt in every corner—and literally every Congressional district—of the United States. Through its direct grants, as well as its support of the U.S. regional arts organizations (including Arts Midwest) and state arts agencies, the NEA ensures that the arts and creativity thrive in small, rural communities as well as in urban centers. The President’s budget proposal is just the first step in a long process—a process in which your voice matters. As Congress prepares its own budget, legislators rely on input from constituents like you to shape their proposal. Now is the time to speak up and make your voice heard. Join Arts Midwest in advocating for the arts and #SavetheNEA now. Contact your officials to let them know the arts matter to you—and why. Send a customizable email, sign the petition, or, best of all, give them a call. If you are in the D.C. area, attend Arts Advocacy Day on March 20–21. Brush up on the facts, but remember that stories are the most powerful tool we have. At Arts Midwest, we believe that the arts are a necessity, not a nicety. Engaging in creative experiences helps people connect to themselves, to one another, and to their communities. The NEA enriches our communities, states, and country. We stand firm in supporting the NEA and advocating for the arts, and I hope you will join us in this mission. Our work begins now in earnest. Together, we can take a powerful stand for the arts, for creativity, and for the NEA. 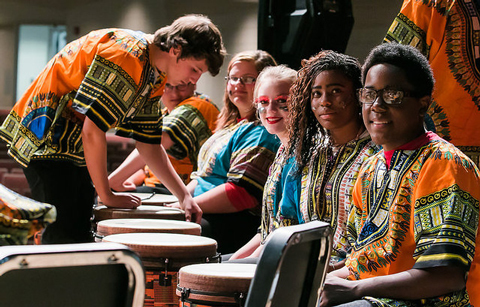 Programs like Arts Midwest World Fest (pictured above) would not be possible without support from the National Endowment for the Arts & our state arts agencies. Photo by Joshua Feist.